Researchers from FORTH/ICE-HT (Dr. John Parthenios, Principal Application Scientist and Prof. Konstantinos Papagelis, Collaborating Faculty member) in collaboration with BIC Violex S. A. (subsidiary of BIC, www.bicworld.com) developed a novel functional PTFE-based nanocomposite coating, incorporating graphene nanoplatelets. The new coating exhibits improved lubricity. Incorporation of the coating onto BIC’s razor blades, could result in a significantly improved product. 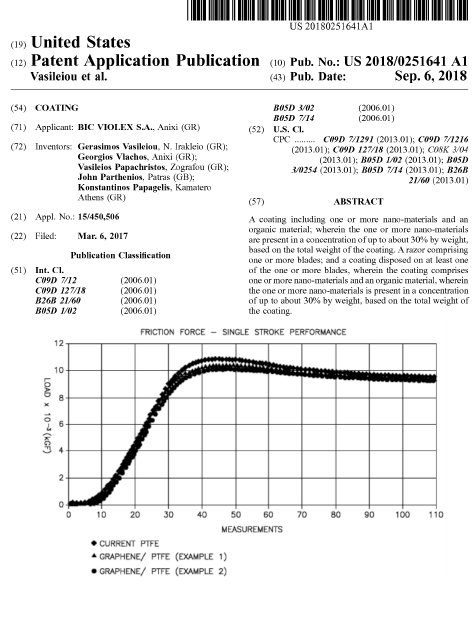 This patent application which has been filed at the US Patent and Trademark Office, is the outcome of a successful collaboration in applied research between industry and a research center in Greece.